Have you heard of Uglegorsk? 5 out of 5 based on 1 ratings. 1 user reviews. 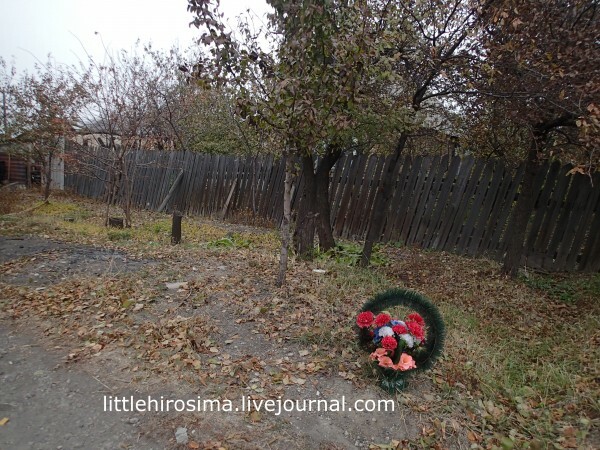 Have you ever heard about the city of Uglegorsk? 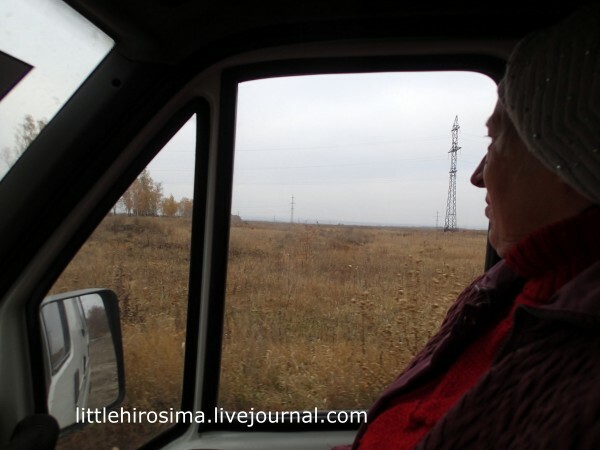 On the road to Debaltsevo. There was a cauldron there too. 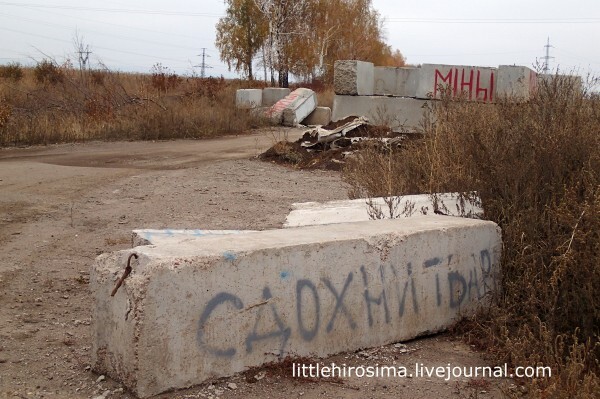 There is constant firing and artillery barrages in Uglegorsk. Sometimes it’s combat, sometimes training. Local inhabitants no longer react. We are unused to it, always look around. –What are you doing, don’t stray off the paved surface! I haven’t even thought of doing that. 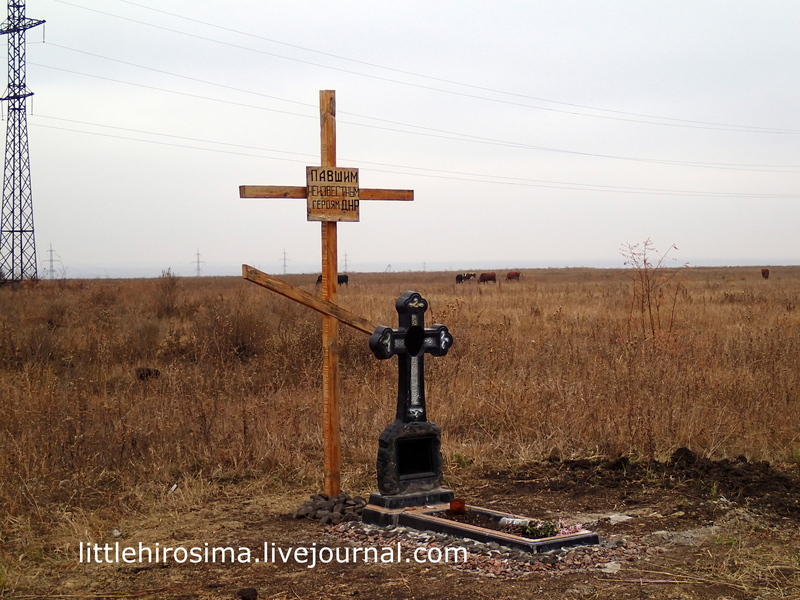 In the Donbass, even in areas distant from the fighting, one should not stray far. Shells, bombs, booby-traps–who knows what you might find. No walking on the shoulder, through ditches. I know these rules well. It will take decades to undo. We’re traveling through the city’s outskirts. Cows, power lines, autumn field. It’s a very oppressive atmosphere. Something’s hanging in the air. Olga smiles and points at teh grave. –The ukrops are right there, across the field. While there’s almost no fighting in LNR, in Gorlovka the skirmishing has never stopped. There is no gas in the city, everyone uses coal which is almost running out even though the city’s name means “Coal Mountain.” The coal mine and enrichment plant have closed. –Nearly everyone ran away in January. During the encirclement. 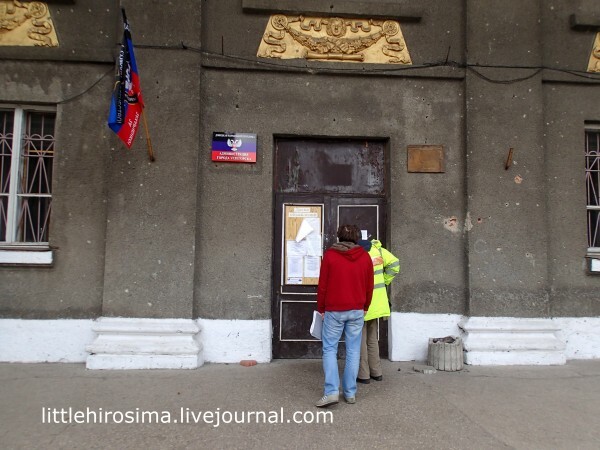 The authorities returned in February. Electricity returned to Uglegorsk only in March. Many people returned starting in the fall. 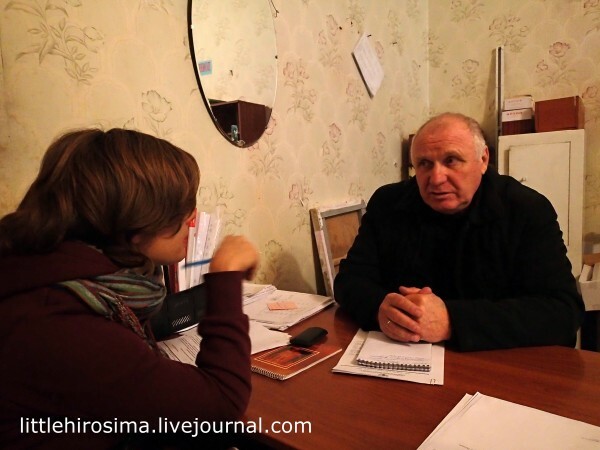 Olga was “assigned” to us by the Uglegorsk acting mayor Oleg Vladimirovich Neleda. The administration is renting a room in the city. The administration building is in ruins, like many other buildings. Oleg Vladimirovich says 90% of the city is destroyed. 52 multi-story buildings were totally destroyed, including two schools and a kindergarten. One schools has been rebuilt. Although can one really compare? This is the city’s main street, Nekrasov’s. Oleg Vladimirovich was a regimental commander in the DPR. Now he’s been assigned as the acting mayor. –I’m probably too old to be running around the trenches. The executive committee is in one room, and the head of the administration sits at the first table by the entrance. Oleg Vladimirovich has a round face, with a clear and penetrating gaze. Before helping us, he “looked us over”, then quickly started to help. Along the way he told us about the city, the fighting. Her 15-year-old grand daughter got a medal. She was helping put out fires when the city was being shelled. The Red Cross was delivering aid the day we were there. Everyone is getting it but it is modest in scope: two cans of canned meat, a package of tea, 1kg flour, 3 packages of rice, 2 of buckwheat, 3 of noodles, dry yeast. We picked up Olga there–she and other volunteers was helping the Red Cross with the lists of inhabitants. While we stood and waited the shelling continued. But nobody even flinched in the crowd. Olga later said it was training. Most likely. –How can you even find out what it really was? So we went out house to house. 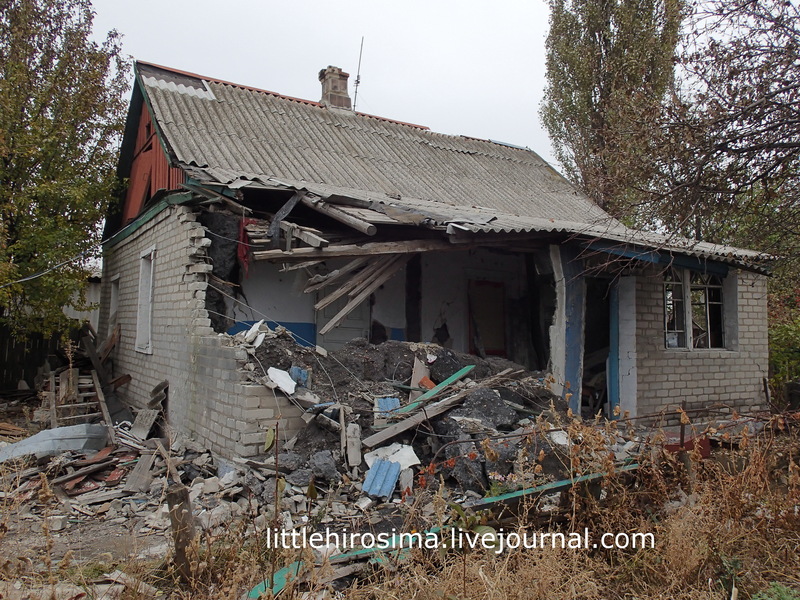 Ludmila Petrovna Surkova’s house was hit by two shells on February 4. 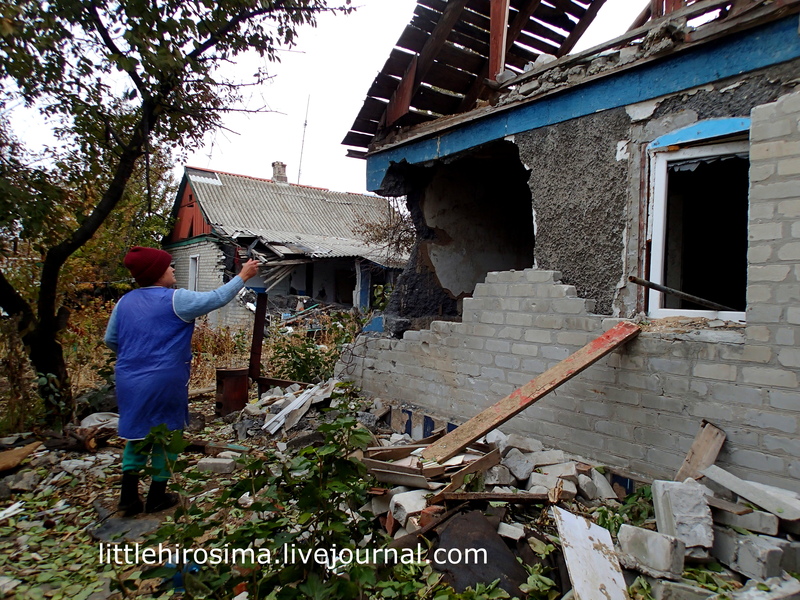 As always in such cases, the people know exactly how many shells struck their home. And they will never forget that number. Now she and her husband live in the kitchen. We couldn’t get inside it. We took the photos right outside. –Let’s go, I’ll show you. 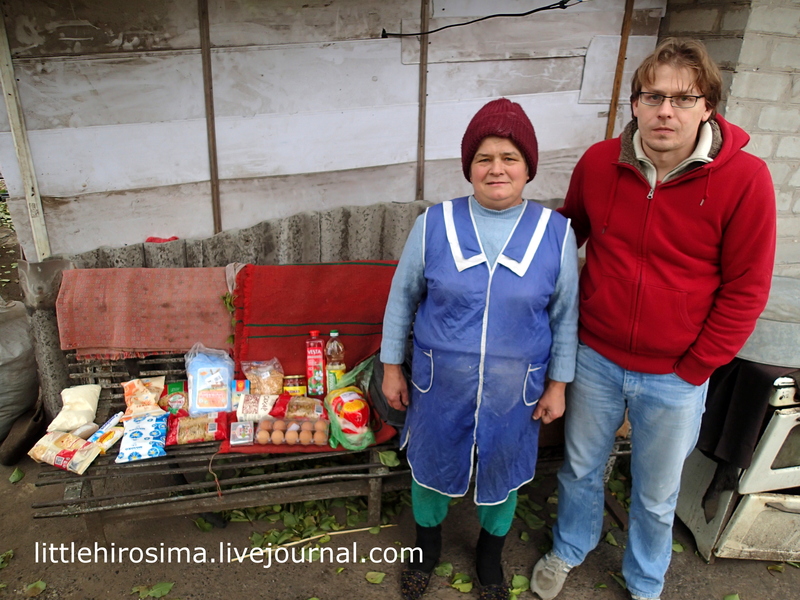 Olga Petrovna and I are walking through the alleys. We look at a shattered house. –This is our destination. Ludmila Andreyevna Koloda. 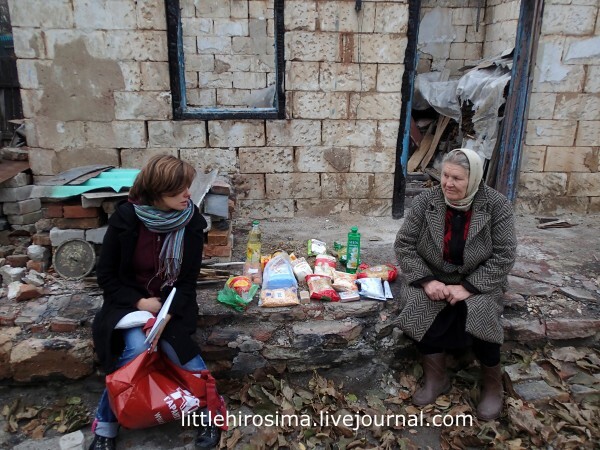 Her house was destroyed, it is now being rebuilt. 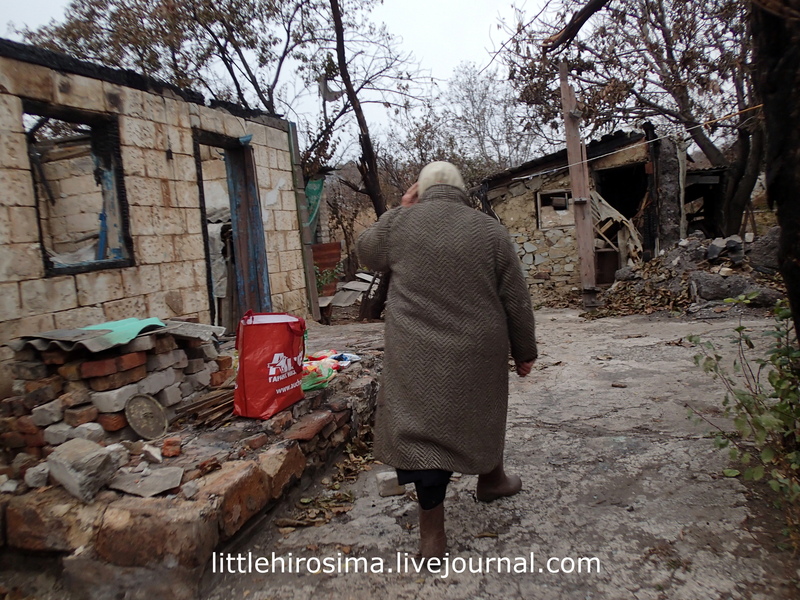 Ludmila Andreyevna comes out of the kitchen where she spent the last year after the house was wiped off the face of the Earth. –January 29. Two shells. 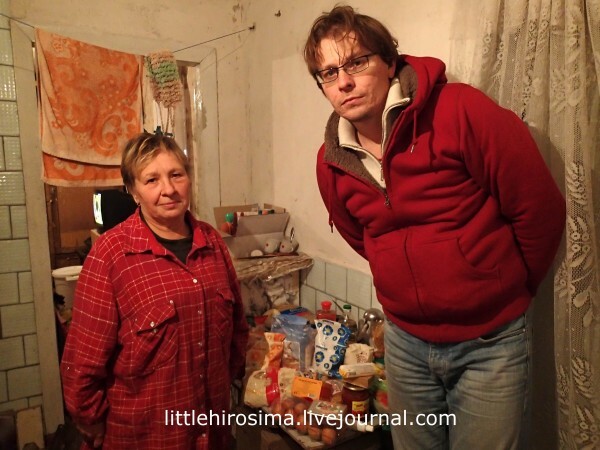 Thank you Russia–it gave money, now they are building the house. Indeed, the Central Directorate for Reconstruction assigned money for rebuilding houses. The money came from Russia. 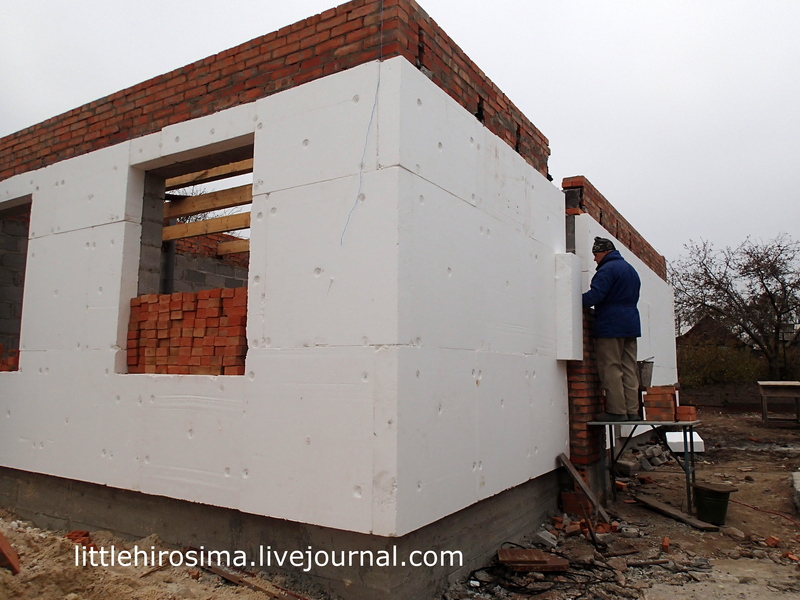 As of the moment of our arrival in Uglegorsk in late October some 23 houses were under reconstruction. Then I found out this program has also been launched in Novosvetlovka and Pervomaysk. And maybe in other places. 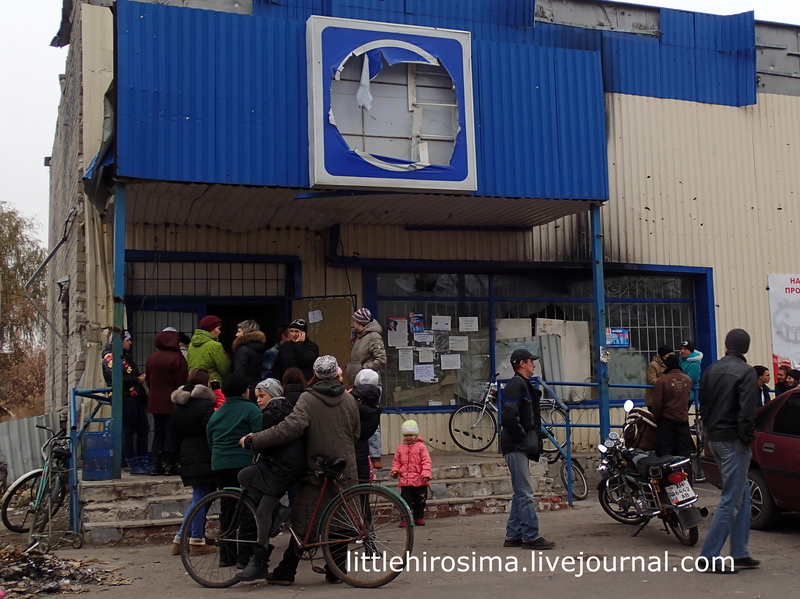 In Pervomaysk, for the longest time they didn’t want to give out money even to replace windows: “They’ll all be broken again”–the city is in a ring. My reports cannot be distinguished from aid accounts. My trips have stopped being about journalism or volunteering. It’s hard for me to even say what I am doing there. Whether I am helping or recording what I see. A new genre of some sort. One destroyed life after another. Valentina Grigoryevna Kramskaya. A shell on October 24. All the out-buildings burned down. –How about we take the aid where you live? –No need, let’s take the photo here. Right in front of the house. Dear Lord, we sat with these crumbs of food in front the stub of her house. And she talked and talked. As we were leaving we saw the wreath. Have you ever heard of Uglegorsk? I never did until last summer. Now it’s part of my life forever, together with that wreath.